Best long-term care insurance quotes. Request free cost quote for long-term care insurance from #1 online consumer information center. 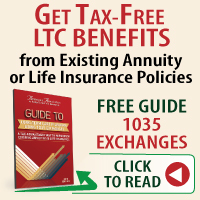 Discover how to use an annuity to ALSO get 100% tax free long-term care benefits. Have a cash value life insurance policy? Discover how to use it to ALSO get 100% tax free long-term care benefits. Find ratings before you buy. Reasons why long-term care insurance claims end. AALTCI report reveals reasons. Washington House passes long term care act. The majority of long-term care insurance claims paid in 2018 were paid to women. ONLINE INSTANT CHAT WITH THE LTC ANSWER GUY Jesse Slome Executive Director of the Association. Available 8am-4pm Pac. Time. Click Here to start chat. Q. How do I get the best rates? Request costs from an Association member or click our Request A Quote box above. Q. What's the best age to start? We believe between ages 52 and 64 for and we explain why. Q. Does insurance pay for home care? Most policies sold today do. 50% of LTC insurance claims started for home care. Q. Are costs tax deductible? They may be fully deductible. See 2012 rates in our Consumer Center. Q. Are insurer ratings important? Very important because you want a company there in the future. We list ratings in our Consumer Center. Chances are you'll live well into your 80s, your 90s and possibly even longer. When you live a long life, the likelihood you'll need long-term health care is greatly increased. Younger people also need long term care as a result of accidents or illnesses. Long-term health care is generally not covered by medical insurance, by Medicare supplement plans or group / employer insurance. For seniors on Medicare, the long-term care benefits are quite limited. That is why over 10 million Americans have purchased long-term care insurance. The American Association for Long-Term Care Insurance was established in 1998 to educate individuals and to support insurance and financial professionals who market this protection. Our Long-Term Care Insurance Consumer Information Center is the nation's most comprehensive resource. Find the most current information including long term care insurance costs, ways to save, tax deductibility rules and long term insurance companies and their ratings. Request a free, no-obligation cost comparison from an Association member today. Costs for long term care insurance can vary significantly from one long term insurance company to another. In fact, our yearly Long Term Care Insurance Price Indexes have found that rates for virtually identical coverage could vary by over 110 percent. It pays to compare - the yearly savings can be substantial. Some 350,000 buyers for long-term care insurance in 2018. Ages when long-term care insurance claims begin. Findings from 2018 newly opened long-term care insurance claims. Shopping For Long-Term Care Insurance? What is the best age to start planning? Let's start with the last question first. Long term care insurers will only issue policies to those in relatively good health. Since you'll probably never be healthier than you are today, this is the right time to start thinking about it. Most people start long term care planning between ages 52 and 64. Each year the Association surveys insurers to determine ages for those purchasing coverage. For individuals purchasing coverage in 2014, some 6.5% did so between ages 35 and 44. Some 25.0% between ages 45 and 54. Some 55.2% between ages 55 and 64. And, 7.8% were age 65 or older. Costs increase based on your age. But the ability to health-qualify is what matters most. In terms of what long term care insurance costs: what you'll pay depends on your age and health when you apply and how much coverage you want. Costs also vary from one insurer to another - by as much as 40-to-110 percent per year. Each insurer has what we call a "sweet spot" and that's one reason to compare costs before you buy. Discounts can make your long-term insurance far more affordable than you think. For example, discounts are offered when two spouses apply. Some insurers will offer discounts to partners living together or a partial discount when only one person is covered. Discounts can vary from one insurer to another. There are ways singles or those living alone can also reduce the cost. Finally a few tips -- though you'll find a wealth of information in our Consumer Information Center. Start comparing costs about 30-to-60 days before your birthday to lock in the lower rate. If you have a health condition or have been prescribed medications, let the insurance agent 'shop your health' before you apply. If you own a small business, read our page on tax deductions for long-term care insurance. The American Association for Long-Term Care Insurance does not market or sell insurance but our members do. Covered care and policy benefits can vary. Fill out the Association's free quote request. We'll connect you with a professional who'll provide advice on planning and costs for insurance protection-without any obligation. Disclosure: It is our desire to deliver the most current, fair and balanced information that assists individuals seeking information on long-term care insurance planning. Information is not intended to provide tax advice and due to the size of our website we recognize some older information still exists. The American Association for Long-Term Care Insurance derives income from membership dues from insurance professionals who want access to our research and support material and may also receive remuneration from our affiliated partners through the placement of long-term care insurance.